Your quick start guide to creating great seating plans - in under 10 minutes! To access the Seating Plan Designer and create a new seating plan, you'll need to be logged in to your TicketSource account. From your dashboard, highlight Events at the top of the page, and select Add New Seating Plan. 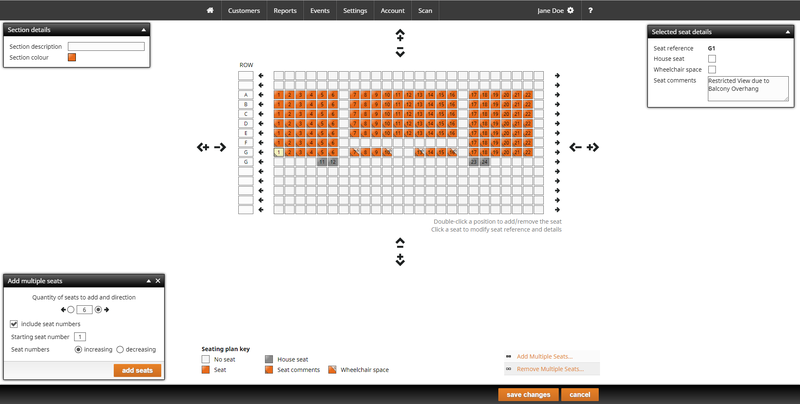 Alternatively, you can access the Seating Plan Designer in the Event Designer. When choosing your ticket allocation, if you choose seating plan and then select create new seating plan you'll see the Seating Plan Designer. Once you've done that, you'll see the Seating Plan Designer. Here you can let your creativity run wild and build seating plans for specific venues, uses and events. The Seating Plan Designer will look a little empty right now, but it's easy to get stuck in and get started. 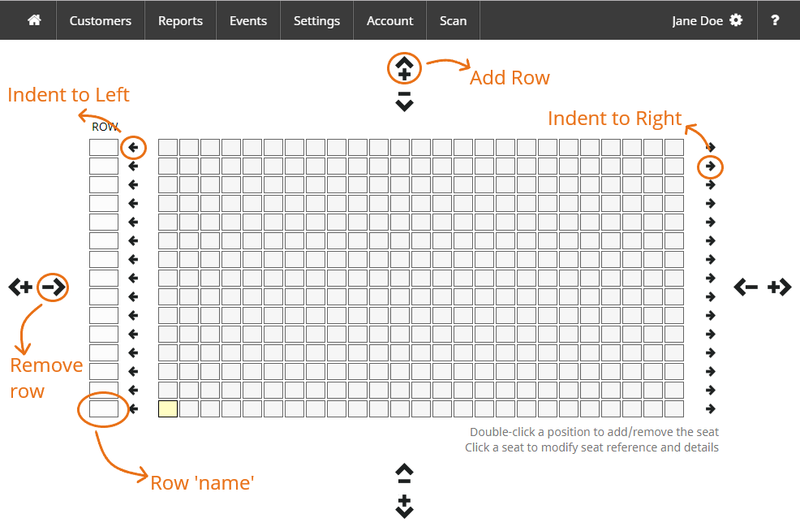 To add a new section to your seating plan, press Add new Seating Plan Section. Again, this part of the designer looks a little empty, so let's start adding some information. All sections must have a name and be assigned a colour, to make viewing the seating plan clearer for your customers. It is recommended that you do not make your sections white, black or grey, as we use those colours as either background colours or as a 'base' colour for blocked or booked seats. To add a name to your seating plan section, type in the text box in the box left side of the page next to Section Description. 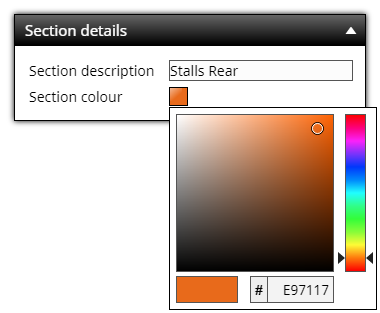 To add a colour to your seating plan section, press the orange box next to Section Colour. This will open a colour picker, where you can use the slider to choose a colour, and then use the picker to choose a specific hue. Your section designer is formed of a 25x15 grid of 'empty' seats. You can make your grid longer, shorter, taller or shorter by using the plus and minus arrows on the top, bottom, left or right of the grid. You can also create a 'staggered' look to your seating plan by using the small arrows on the left or right of the grid. These will make the rows indented slightly. 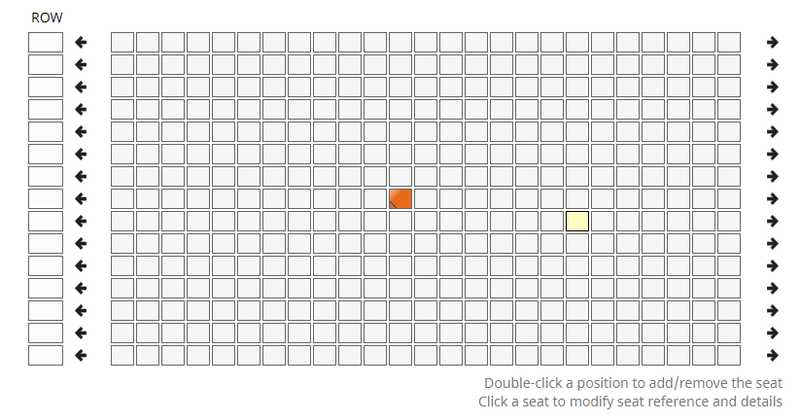 To add a single seat, double-click on a space on the grid. This will create a blue border around the seat and move your cursor inside the seat. This is so you can add a seat number if you wished to. Clicking off that seat will turn that space from white to the colour you chose your section to be. To remove a single seat, double-click on the required seat. You can easily add a row of seats by clicking the option at the bottom of the page which says Add Multiple Seats. This will open a new box in the bottom left side of the page. 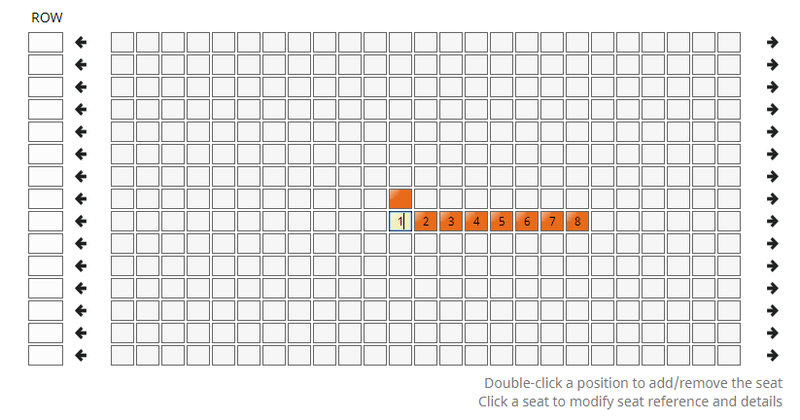 Simply add how many seats you want to add, which direction they are going in and choose whether to add in seat numbers. Then select the row starting position on the grid and press Add Seats. If you choose to add seat numbers, you can select whether those numbers are increasing or decreasing. Removing a row of seats is similarly easy. 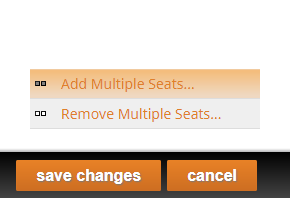 Select the option at the bottom of the page which says Remove Multiple Seats. This will open a new box in the bottom left side of the page. Change the number to suit how many seats you wish to remove and choose which direction, then press Remove Seats. Both the Add Multiple Seats and the Remove Multiple Seats boxes are collapsible by pressing the small arrow. You can also move the boxes by dragging them across the screen, and you can close them by pressing the small 'x' in the top right corner of the box. 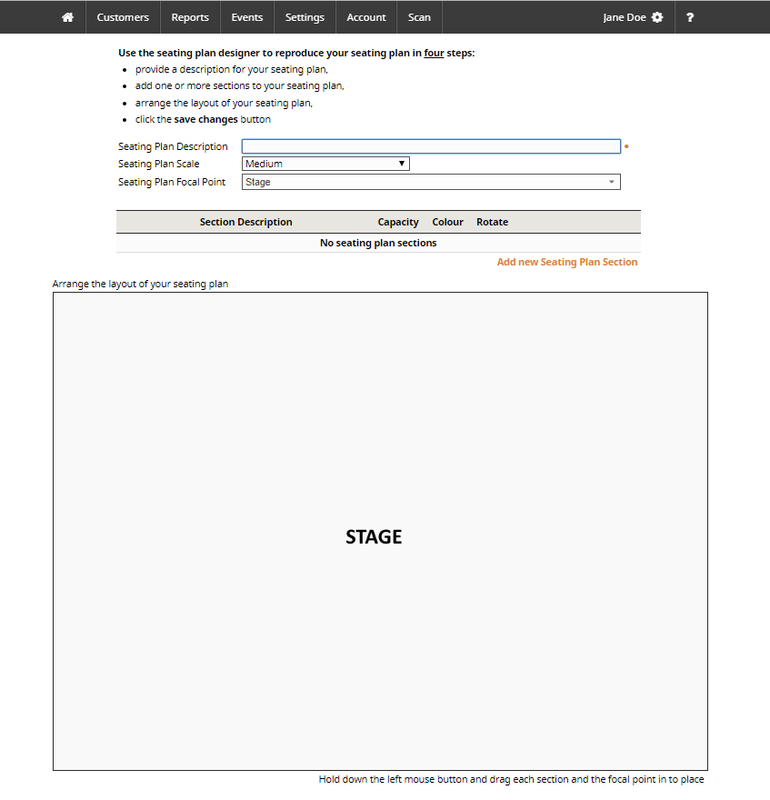 In the top right corner of the page, there is a box for adding Selected Seat Details. 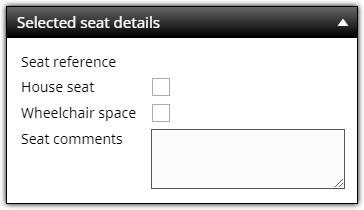 When you have selected a seat on your section grid, you can add seat details in this box. To add a House Seat press the House Seat check box. This will show the seat as unavailable to book, and reserve it for members of staff. To add a Wheelchair Space press the Wheelchair Space check box. This will create a small wheelchair indicator in the top right side of the seat, and when booking, customers will see that space is reserved for wheelchair bookings. You can also add comments to notify customers of restrictions or comments attached to specific seats. To do so, type in the text box next to Seat Comments. This will add a small triangular marker to the seat which will produce a pop up when a customer selects the seat at the time of booking. You can use this to tell customers there is a restricted view, or that they are sat in an aisle seat. The difference between allocated and unallocated seats in just one simple thing - Seat Numbers! To allow your customers to choose a specific seat then select a seat and type a number in. You can also choose the option to add seat numbers when using the Add Multiple Seats function. Seat numbers can go from 1-999. If you are adding seat numbers, be aware that if you don't add rows to your section plan, you'll need to have all your seats have a different number. To add a Row, type in the text box which corresponds with the row on the grid. Rows can only be letters A-Z, with no special characters but can be up to 3 characters long. If you're happy with your section and ready to add it to your seating plan, then press save changes at the bottom of the page. This will add your plan to the map on the Seating Plan Designer. If you haven't inputted all the required information, or if you have a duplicate seat number or a seat missing a reference then you will see a pop-up appear reminding you of this. Once you've saved your section, make sure you save your overall progress as you go along by pressing save changes at the bottom of the page. If you look at your section on the map and realise you missed something, you can modify a saved section by pressing modify next to the section name. This will bring you back to the Section Designer. You can have both allocated and unallocated seating in one seating plan. If you create one section with seat numbers and a second section with no seat numbers then you will be able to market for both allocated seating for the customer to choose, and first-come-first-serve seats for customers to choose on the day. You can choose the size of your seating plan and how it appears to your customers by choosing a scale from the Seating Plan Scale drop-down. 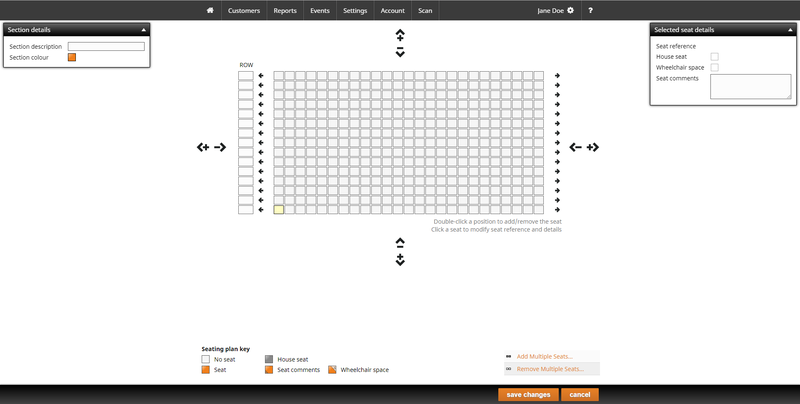 To move your seating plan sections, simply drag them across the seating plan map into the position you want them in. You can also use the rotational arrows next to the section name to turn the sections. If you need to edit your seating plan, you can do so by going to Events at the top of the page and selecting Modify Seating Plan. Then, select the seating plan you wish to modify from the drop down and press Modify Seating Plan. This will open the 'master' seating plan. Any changes made to this seating plan will be evident for any future times this seating plan is used. When you add a seating plan to an event, you create a template of the 'master' seating plan. If you need to make any changes to a seating plan in your event you'll need to do so in the Event Designer. Be aware that any changes to this template will not be saved on the 'master' seating plan. Are you organising an event at a venue you know already uses TicketSource and has a seating plan ready-made? Chat to the other event organiser and both email us at support@ticketsource.co.uk and we will transfer the seating plan over! If you wanted to read more Knowledgebase articles about creating and managing your seating plans, follow this link!